Powell Gardens, Kansas City’s Botanical Garden is a young garden (it celebrated 25 years in 2013) that was well-planned from inception. Nationally renowned landscape architects from Environmental Planning and Design and its spinoffs planned the 970 acre garden. Major gardens include Perennial, Rock & Waterfall, Meadow, Island, Fountain and Heartland Harvest Garden (America’s largest edible landscape). Powell Gardens’ architecture is classic prairie style by E. Fay Jones and Maurice Jennings Architects – in fact, Powell Gardens contains the largest collection of their works at a public facility, and Mr. Jones was voted the 4th most influential architect of the 20th Century bythe American Institute of Architects. However that may be, sometimes the seedof a garden is not sown by a master plan or designer. A garden’s staff, board or major donor can influence plans, but Powell Gardens has been careful not to letthis create a hodge-podge collection out of touch with the mission: quality design and premier horticulture standards. In 2006, a major fountain garden was constructed to the north side of the Visitor Center and it unearthed the site’s sandstone subsoil, beautifully drained with a slightly acidic pH -- so different from the wet, poorly drained clays of the gardens' topsoil. The new Fountain Garden required an extensive change of grade with new walks from the north end of the building. An existing bald cypress (Taxodium distichum) at the northwest corner of the building’s terrace walls and a trio of wonderful lacebark pines (Pinus bungeana) at the northeast corner of the building’s terraces were retained and these plants anchored the new garden’s plantings. The landscape fill required for the new beds would be from the fountain construction sandstone rubble subsoil which would allow the perfect soil for most conifers and plants requiring well-drained soil. So, the new north end bed of the visitor center, raised and constructed with well-drained soil was planted to a beautiful border of conifers with emphasis on varieties which would take the site’s windswept location (there was at that time an open field to the north). Initial plantings were Juniperus formosana, Juniperus rigida ‘Temple’, Juniperus communis 'Oblonga Pendula', Pinus strobus 'Pendula, Taxodium disticum 'Peve Minaret' and Peve Yellow, and a beautiful blue-needled Abies concolor 'Candicans'. Picea orientalis ‘Shadow’s Broom’ and ‘Connecticut Turnpike’; and Pinus sylvestris ‘Nana’. The new conifer borderattracted so many positive comments from visitors that it became its own garden, separate from the Visitor Center’s beds and soon needed more space. Of course, the Conifer Garden displays more than just conifers and has a beautiful tapestry of several groundcover-type sedums, some smaller perennials which require well-drained soil conditions, and other dwarf companion shrubs from boxwood to Weigela. The garden was mulched with pea gravel for a finished look and to hold in moisture. The garden was again increased in size in 2008, to include Thuja occidentalis ‘Rosenkranz’ Pinus densiflora ‘Umbraculifera’, Thuja plicata ‘Virescens’, Picea orientalis ‘Skylands’ and even a trial Cunninghamia konishii ‘Samurai’ China-fir. 2012 brought another extension of the Conifer Garden by creating a bed alongside the east side of the garden. Paths which lead north from the Visitor Center to the Fountain Garden and the new Heartland Harvest Garden pass along this east side of the Conifer Garden. A new bed, constructed with remaining sandstone rubble besidethe path, provided the last “east wall” of the outdoor room which is the ConiferGarden. This (final?) conifer bed includedmany specimens donated by Marvin and Iseli Nursery including Pinus bungeana ‘Rowe Arboretum’ Cupressus nootkatensis‘Sparkling Arrow’, Juniperus virginiana ‘Pendula’, Picea omorika ‘DeRuyter’, Taxus baccata ‘SilverSpire’, and others. 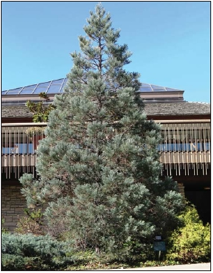 The Powell Gardens’ Conifer Garden is maintained by horticulturist Richard Heter and gardener Peggy Batman. Its 110 cultivars of conifers and gymnosperms are curated by Marie Fry, who manages the plant records. It was designed by Alan Branhagan. It wouldn’t be what it is without the inspiration and generosity of Marvin Snyder, and plant donations from Rich Eyre and Iseli Nursery. The garden survived the 2012 season which was the driest growing season ever recorded for the Kansas City region and as well as being the hottest year (as of the end of September). The Conifer Garden did lose a very few choice plants and have some needle burn on a few others, but the garden is overall a resounding success with many positive comments by visitors. Gardens are never static, but constantly evolve as plants grow larger and extremes of our heartland climate test the adaptability of all the unique conifers we grow. As some specimens become too large for their space, they may be transplanted to other locations at Powell Gardens. New conifers will continue to be added to fill spaces and create new color, texture and shape compositions. The hope is that visitors to Powell Gardens are inspired by the garden, and will think differently about conifers beyond standard foundation plantings to the incredible wealth and beauty of unique cultivars available at nurseries. Powell Gardens was designated an ACS Reference Garden in 2012. There are approximately 800 conifers to be found throughout the extensive gardens. Nut pines can be found in the Heartland Harvest Garden including the rare Pinus gerardiana. The Mediterranean inspired vineyard landscape in that garden utilizes ‘Taylor’ junipers (Juniperus virginiana) in place of columnar Italian cypress, which are not hardy here. 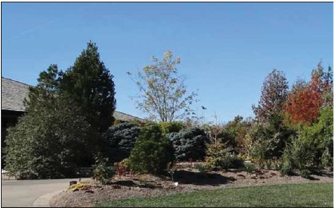 Bald cypress, dawn redwoods, pines and spruces are widely planted as part of a total of 22 genera and 81 species of conifers found at Powell Gardens. More obscure species include Florida torreya (Torreya taxifolia), Floridayew (Taxus floridana), northern hiba arborvitae (Thujopsis doltsopa var. hondai) and Cathay pine (Cathaya argyrophylla). All conifers are clearly identified by plant labels.